Join ACRL Arts Publications and Research Committee for our Annual Discussion Forum! If you’re headed to ALA Annual, make sure to checkout our fabulous ACRL Arts Annual Discussion Forum! No current research exists directly examining the information needs of dance scholars. Their research behaviors and library use are widely unknown, particularly in regard to issues of access to historical materials and new technology preferences. In the past thirty years, college and university dance departments in the United States have developed into independent, research-based programs. Academic librarians must understand the research behavior of dance faculty in order to support the performance, research, and pedagogy of these programs. Interviews with dance faculty from three diverse institutions of higher education provide exploratory data about these scholars’ research needs. This qualitative study provides context for dance faculty experiences as both artists and teachers. The findings from these interviews suggest that dance is a multidisciplinary and multicultural practice. Dance scholarship and practice embody history and religion, race and ethnicity, gender and sexuality, biology and neuroscience, and visual and performing arts. Contemporary dance faculty are at home in the studio, classroom, and computer lab. Dance faculty have a broad array of subject interests and research needs. As dance embraces new disciplines and methods of performing, our notion of dance must broaden. In order to fully understand their information behaviors, librarians should use interdisciplinarity as a lens through which to view current dance research practices. The data gathered from these interviews will be of value to librarians as they determine collection development practices and reference services for their particular dance and performing arts programs. The Rutgers University Art Library Exhibition Spaces (RALES) were created to further engage the local communities by elevating the importance of scholarly research happening in the Arts, as well as providing an opportunity for budding artists to learn more about what goes into an exhibition, from creation of the work, to the public viewing, marketing, and reception. RALES also provides an opportunity for individuals to view artworks in person, as opposed to studying an image in a book. In two and one half years this teaching gallery has hosted 27 exhibits by students, faculty, and staff, of Rutgers, as well as a few local and out of state artists. There has been little to no cost to run this gallery space, other than the time. The most impactful aspect of RALES is that is has created a deeper connection to the community by building new bridges across the campuses and introducing the libraries to many new potential partnerships. This presentation will present the physical make up of RALES and provide tips on how one can create their own low cost gallery space. This presentation will also provide examples for ways to find artist and curators as well as provide access to a digital guide that was created as an archive for RALES. This presentation will be a dynamic visual presentation including text, comments by viewers, publicity created about RALES, images, and a discussion about the impact of these exhibition spaces. This presentation reports on music faculty’s format preference of music material. Historically, collection development has focused on what material to purchase. However, with the maturation of web-based music audio databases, web-based video databases, online music scores, and electronic books and reference material, the format of material is also now an important collection consideration. This presentation reports on the results of a music material format preference survey completed by music faculty at a large, comprehensive state university in the spring of 2016. This session will present the purpose and setting of the collection, the survey results, and the implications for music library collection development. Check out our Orlando ArtsGuide! 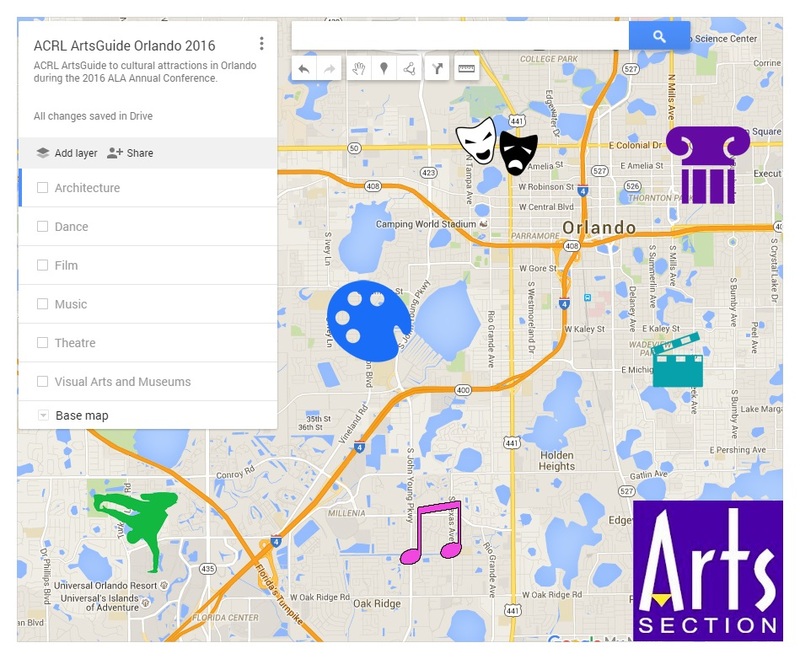 It’s a mobile-friendly Google map of cultural attractions and events in or near Orlando, and has been created for attendees of the 2016 ALA Annual Conference in Orlando, Florida by the ACRL Arts Section. Plan on taking pictures of the arts/performances you attend during the conference? Share your photos via our Facebook page or tweet about it using the hashtag #ArtsSection. The results are in and our next vice chair (2016-2017)/chair elect (2017-2018) of the Arts Section is Jennifer Cox. Jennifer is the Supervising Librarian at The Art Institute of Portland. Art education is a critical part of our nation’s enduring cultural fiber. As Vice-Chair, I hope to support our section by strengthening our collective voice in this challenging and changing educational climate. It is my hope is that we provide relevant skills and knowledge through training opportunities to our sections membership. Personally, I plan to act as an advocate to assist and support our section and those we serve through our work. As a member of several other small round tables and sections, I am sensitive to the issues that impact our field and the importance of outreach to work with other sections. An area of challenge and opportunity is recruiting and retaining members to strengthen our voice for the support of art education in the evolving educational landscape today. I will work with other Section leaders and Art Section members to develop innovative and creative programs that will assist us career innovation and outreach to our colleagues at our institutions. The Arts Section is changing and doing new things to better serve it’s members. Be apart of building the Section back up. Run for office. We are looking to fill the position of Secretary and Vice chair for a term of 2017 – 2019. Hello ACRL/ Arts Section members! I am the chair of the Strategic Planning Committee, and I am very excited to introduce you to the section’s new core values and strategic directions. The planning process began in November, when the previous chair of the Strategic Planning Committee stepped down. Shortly after I became the new chair of the committee, the Vice Chair/ Chair Elect of our section’s Executive Committee Kai Alexis Smith and I began looking for the last strategic plan that the committee had drafted. There was not a strategic plan on our website, and even the longest-serving members of the committee and the section could not recall ever seeing one. After it was determined that there wasn’t an existing document to work with, Kai charged the Strategic Planning Committee with drafting a strategic plan for the next five years. Throughout the winter, the committee held online meetings in Google Hangouts and via email to discuss the section’s goals. We thought about what the section could do to move forward and to stay relevant, and what the section could do to be a resource to and support arts librarians. Four common themes emerged: member retention and engagement, professional development, organization within the section, and communication within the section. After the Executive Committee reviewed and agreed with our goals for the section, we decided that we would pursue a statement of strategic directions. While a strategic plan would be looking at the next five years, the strategic directions will allow us to be more nimble and to change with the times.In addition, with the help of the Executive Committee core values were drafted. The Strategic Planning Committee will review the new directions and core values annually, and we’ll also seek input from Arts Section members every year! Developing an open, inclusive, and collaborative environment for students interested in becoming an academic liaison to the arts and art library professionals (includes, but is not limited to: arts, art history, dance, and theater in all types of libraries). Cultivating excellence and innovation of art library services to all types of users. Employ ethical practices, professionalism, and integrity related to library services and resources. Membership. Seek ways to engage and actively involve both new and existing members for increased retention. Professional Development. Foster and develop programming and continuing education opportunities for members to discuss current trends in academic arts librarianship. Organization within the Section. Facilitate the transfer of leadership and continuity within committees through record keeping and communication. Communication. Strengthen communication within the section in order to improve the presence and value of resources to Arts Section members. As the Arts Section implements these new directions, you’ll notice a few changes! Expect more frequent updates from the Executive Committee, new website, new networking and mentoring opportunities, a new template for submitting committee minutes and reports, an improved orientation manual, increased social media usage, and even more. To better learn about our members and what they hope to get out of their membership in the Arts Section, the Strategic Planning and Membership committees are working together to develop a survey. When you receive the survey this summer, please take a few minutes to fill it out. Your input will help guide the section forward! Interested in becoming a representative for IFLA? ACRL invites applicants to serve as ALA representatives to IFLA standing committees for the 2017– 2021 term. There is currently one vacancy for Art Libraries. To apply for the Art Libraries ALA representative to IFLA, submit the materials detailed below, to Megan Lotts at megan.lotts@rutgers.edu no later than May 6, 2016. Completed “Request to be Nominated to IFLA” application form: http://www.ala.org/acrl/resources/forms. ACRL sections review the IFLA representative applications and make recommendations to the ACRL Leadership Recruitment and Nominations Committee (LRNC). The LRNC will review applications at the 2016 ALA Annual Conference in Orlando. The LRNC then submits its recommendations to the ACRL Board for consideration at the 2016 Fall Executive Committee Meeting. In turn, the ACRL Board submits the approved candidates for nomination to the ALA International Relations Committee in November, 2016. Please review the detailed guidelines located at: http://www.ala.org/acrl/resources/policies/chapter7#7.2.3. Members are nominated and officially endorsed for a four-year term to every IFLA section standing committee at each IFLA election. The new appointments will be for the 2017 – 2021 term. Individuals can only serve on one IFLA committee at a time, and a maximum of two consecutive terms. Any ALA/ACRL member may be suggested for nomination to one of the six IFLA standing committees above. Individual applications for nomination are also acceptable. Current incumbents who are eligible for a second term may apply for continuation. Transmit a copy of the report(s) to the ALA International Relations Committee. Questions? Please contact the ACRL Program Officer Megan Griffin, mgriffin@ala.org or Megan Lotts at megan.lotts@rutgers.edu or call (848)932-7189. I am your new ACRL/Arts Chair. Unfortunately, chair elect Greg Hatch of the University of Utah decided to step down in early Fall 2015. With the support of the Executive Committee and ALA Liaison Megan Griffin, I am getting caught up on my new responsibilities. I am very excited to lead the section and am very happy to bring you a number of updates and developments. 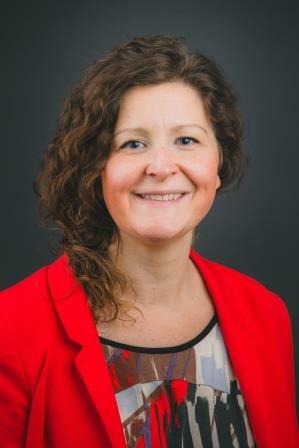 First, we are very happy to have Sandra Gekosky from West Virginia University at Parkersburg as our new Social Media Manager. Shortly, we will have our Twitter, Facebook and blog up and running again after a long hiatus. 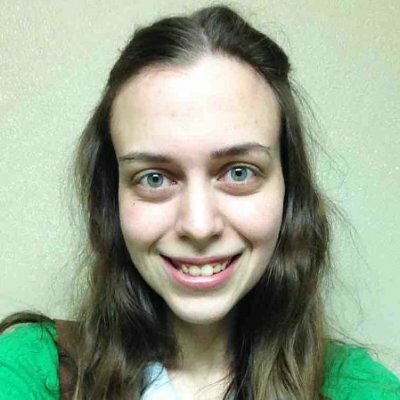 We are also excited to have Shannon Robinson of Drexel University on the team to maintain our website presence. Even if you didn’t attend Midwinter, check out our Arts Guide here. The Membership and Outreach Committee works hard to assemble these guides for the membership for both the Midwinter and Annual Conferences. We are always looking for ways for the membership to engage with each other and discuss topics of interest. However, there were a number of discussion groups and a committee that was recently dissolved because of inactivity. These include the Digital Technologies in the Arts Committee, Digital Arts Discussion Group, and the Film and Broadcast Studies Librarians Discussion Group. We strongly encourage discussion groups. Please feel free to contact me if you have ideas or bring them to the Executive Committee meeting at the Annual Conference in Orlando. Both the Executive Committee and I would be delighted to hear from you! Before we know it, the Annual Conference will be here in no time. Again this year, the Section will be holding meetings at the conference. I look forward to engaging with you all then and working with you all in the coming years! Please join us for the ACRL Arts Virtual Midwinter Discussion Forum on Wednesday, January 6, 2016, at 11 AM PST / 1 PM CST / 2 PM EST. Details to connect coming soon. Summary: Virtual Library of Virginia has a project reviewing video and DVD holdings of eight doctoral institutions across the Commonwealth of Virginia. This presentation will focus on what this has uncovered about art education film holdings and use trends among these collections, as well as how this can help inform collection decisions for these collections and future media purchases for VCU. Summary: In this virtual discussion forum participants will learn about the advantages and disadvantages of having a subject specific library in close physical proximity to the college and departments it serves. The Performing Arts Library (PAL) at Kennesaw State University is a small, 700 square foot, one room library. Though funded and operated by the University Library System, the PAL is physically separate from the main library and housed in the institution’s College of the Arts (COTA). The PAL contains COTA subject specific material, e.g., play scripts, music scores, study scores, and chamber music. In addition, the PAL is staffed by librarians with performing arts degrees and experience and by student assistants who are performing arts majors. After a brief summary of the history of the PAL, this session will present how such close physical proximity between library and college effects liaison relationships, reference service, technical service, and collection development. The various advantages and disadvantages of such physical proximity will be presented and discussed. What are your favorite art places in Boston? The ACRL Arts Section is seeking contributors to the Boston ArtsGuide for the upcoming 2016 ALA Midwinter Meeting. The ArtsGuide is a semi-annual guide. This edition will be produced in the form of customized Google Map developed by the ACRL Arts Section’s Publications & Research Committee to help ALA conference attendees find arts-related venues and events in and around host cities. It’s a great opportunity to get involved with the ACRL Arts Section! It’s also a fun way to contribute your knowledge of the area to enhance everyone’s conference experience. Both ACRL members and non-members are welcome to contribute. You can see previous ArtsGuides here. to add content to our sections: Visual Arts & Museums, Architecture, Dance, Theatre, Music, Film. Submissions are due by December 11, 2015. The ACRL Arts section invites you to submit a presentation proposal for our in person Discussion Forum to be held on Saturday, June 27, 2015 at 10:30am. Presentations can be on any topic pertaining to the arts or design. It can be a project that you are currently working on or research you are engaged in. There is no requirement for presenters to be Arts Section members to participate. Students are also encouraged to make a submission. Each presentation will be 15-20 minutes with a short Q&A after. Proposals should include presenter name, position, and institution as well as a presentation title and a short abstract. Please submit your proposals at http://goo.gl/forms/yeqP2vgVpA. The deadline for submissions is Tuesday, June 8. Chosen presenters will be notified on June 10. Any questions, please contact Claudia Covert, ACRL Arts Publications & Research Committee Chair at ccovert@risd.edu.